We want to show you a simpler and faster way to learn to read Japanese. Instead of studying each kanji character in isolation with the use of flashcards or writing each one by hand while hoping someday to arrive at the point where you can actually read Japanese articles, why not try learning kanji and vocabulary more quickly with the help of mnemonics and then practice reading them in real sentences almost immediately? If you are interested in buying this book, please review the different buying options that are described on our How to Read Japanese page. You can see a review of the book at this site (it’s the second review on the page). How does this Book Differ from Volume I of Learn to Read in Japanese? In both books, we make it easier for you to learn to read Japanese by introducing new kanji at the beginning of each chapter and then asking you to take a quick pre-test on their pronunciations before you start to read. The practice reading material in each lesson includes only kanji characters that you know or are in the process of learning, and we provide immediate feedback about your reading accuracy in the form of same-page romaji equivalents and translations. As we did in the first book, we provide at least three practice sentences for each new kanji in Volume II, for a total of about 1660 sentences. You will notice a few changes to the format of Volume II, compared to Volume I. First, we reduce the number of kanji that we introduce in each chapter from ten to eight. Second, we group the new kanji in the Kanji Catalogue by chapter, so that it’s easy to study them in groups of eight before starting a new lesson. Third, in addition to providing sentence reading practice, we include more than 2,900 Japanese words and phrases for vocabulary reading practice. This vocabulary comes from three sources: the examples in the Kanji Catalogue, the practice sentences in each chapter, and the optional supplemental reading material available online. Here is a sample of the Japanese Reader from the second book, demonstrating the innovations described above: Japanese Reader, Sample. We introduce 600 new kanji in this book. If you learn to recognize and pronounce them, you will have come a long way in your endeavor to learn to read Japanese. In addition, the Kanji Catalogue near the back of the book includes all of the kanji that were introduced in the first book, for a total of 1208. Here is a sample of the Kanji Catalogue from the second book: Kanji Catalogue, Sample. Step One. Kanji Catalogue. Before you start a chapter, turn to the Kanji Catalogue and take some time to review the eight new kanji that are listed in the New Kanji table at the beginning of the chapter. Your aim should be to acquire the ability to recognize each kanji and associate it with its pronunciations. Step Two. Pronunciation Pre-Test. Next turn to the chapter that you are about to start reading and take the “Pronunciation Pre-Test.” To do this, look at the New Kanji table and try to voice each of the pronunciations for all eight of the kanji in the table. Use the table at the bottom of the page to check your accuracy. Repeat this test several times until you feel ready to start reading. Step Three. Vocabulary List with Mnemonics. Next start reading the Vocabulary List, being careful to cover the “answers” on the right side of the page with a piece of paper or your thumb. You will usually have a chance to practice reading each new kanji multiple times in different words. You will also see more than 2,800 mnemonics for the words that appear in the Vocabulary Lists. Step Four. Practice Sentences. Next read the Practice Sentences that are provided in each chapter. This is where you will really feel that you have started to learn to read Japanese. Again, be sure to cover the text on the right side of the page as you read, but don’t hesitate to uncover it if you aren’t sure about kanji pronunciations or when you don’t know how to translate the Japanese text. Step Five. Supplemental Reading. We hope that you will take this last step, but it is optional. We have identified some fascinating Japanese language articles online that use only the kanji that you have learned up to this point. These articles are available from “Satori Reader” and from “News in Slow Japanese” – see the additional information below. If you read these articles, you will see that you have made significant progress in your effort to learn to read Japanese. The supplemental reading material can be found in two online resources: Satori Reader and Read in Slow Japanese. This reading material meets the following criteria: it includes romaji or kana equivalents of the kanji, it includes English translations, and it does not contain furigana, since furigana can interfere with the acquisition of reading fluency. In order to ensure that these resources contain only kanji that you know or are learning, we introduce kanji in this book in the same order that they are introduced in the resources. As a result, when you have completed Chapter 2 of this book, you will be able to read the first article in Satori Reader. When you have completed Chapter 3, you will be able to read the second article, and so on. Likewise, when you have finished Chapter 48 of this book, you will be able to read the first article in Read in Slow Japanese. When you have finished Chapter 50, you will be able to read the second article, and so forth. Understandably, the authors of these resources charge nominal fees for access to their original work. If you are unable to afford those fees, you may consider this supplemental reading practice material optional. To help keep your expenses down as you learn to read Japanese, Satori Reader is offering a discount code, good for 20% off the first three months, or 15% off the first year of a new subscription. To use this, first create an account on Satori Reader. Then, from the “Subscribe Now” screen (either during the signup process or later at any time), simply choose a Monthly or Annual subscription, enter the code where prompted and hit “Apply.” The page will immediately update to show the discounted price. You can then complete the purchase with the discount. The code is LTRJ-ZLWWTWAC. News in Slow Japanese also offers some very reasonable rates, including a “non-recurring” option that never expires. We hope that you will be able to subscribe to these two resources, at least briefly. You will almost certainly experience a thrill when you find that you are able to read the compelling Japanese text that they provide. You will probably want to save that text and re-read it several times. In addition, during the time that you subscribe, you will have a chance to listen to the audio versions of the articles, and you will be able to read the excellent explanatory material that accompanies them. Below you will find samples of the first lessons from both online resources, reproduced with permission from the authors. I have formatted them in a way that should make it easy for you to read the Japanese text without inadvertently seeing the romaji, while still allowing you to locate explanatory material easily as you read. In this formatting scheme, the Japanese text appears in font size 14. After each line of Japanese text, there is a blank line. Then the romaji text appears in font size 8, supplemented by occasional explanations in parentheses which I have added. Satori Reader does not provide romaji text. You may not need it, but I find it easier to use romaji for feedback while reading. Therefore I have used the Google Translate service to convert the Japanese text from Satori Reader to romaji text, as you can see in the sample. The JLPT testing organization does not release the exact kanji that are required for each level of the test, so different people are supplying their own estimates. According to one estimate that I saw, the JLPT N5 test requires knowledge of 103 kanji, and the N4 test requires knowledge of 181 kanj. All of these kanji are taught in Learn to Read in Japanese, Volume I. According to the same source, the JLPT N3 test requires 580 additional kanji. 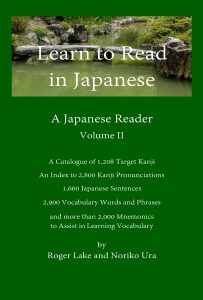 Since Volume II of Learn to Read in Japanese teaches 506 of those kanji, there appear to be 74 more kanji required for the test which Volume II does not teach. Below is a list of the additional kanji that students who are planning to take the JLPT N3 test might need to learn, in addition to those covered in Learn to Read In Japanese, Volume II. Note: it’s possible that the information that I’ve relied on to determine which kanji are needed for the test may be unreliable. Please let me know if you discover any discrepancies.